This is obviously intended for some full or part-time detailers (or enthusiasts with intent to move into the detailing career). Hard work means you’re going out of your way to make sure the job is done right, without cutting any corners and calling it quits. This is the biggest marketing tool as clients tend to appreciate the hard work and believe you’re the right person for the job. Without hard work, there’s no quality results of which you can take pretty pictures and post all over your website, Facebook, etc. There’s also no positive reviews from clients that you can show to other potential clients, so it all comes back to the hard work. Next is the quality of service and as with anything, this is extremely subjective. 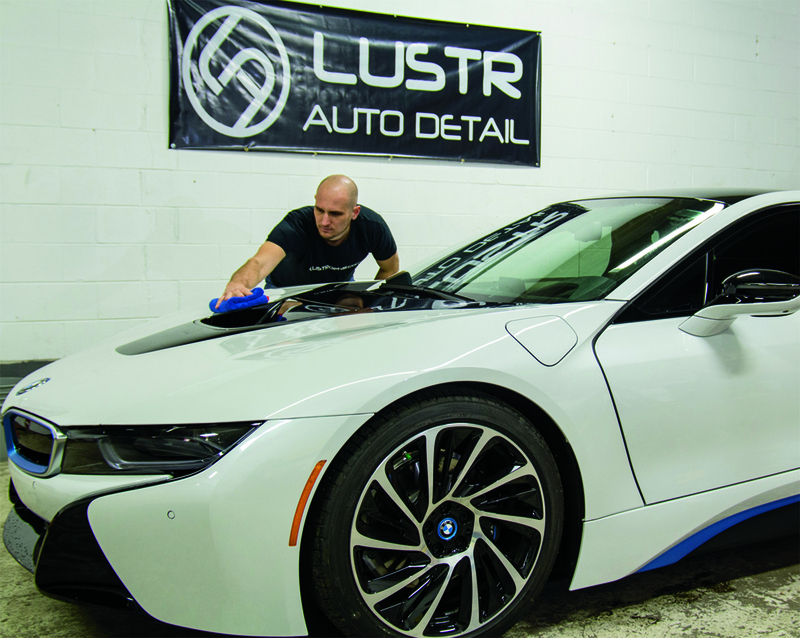 Some of our clients are extremely happy with a quick all-in-one polish and others are satisfied with a $2000+ paint correction and protective coating job because we couldn’t safely remove a few deep scratches. The key is to know what you’re capable of, what your clients want and what is the appropriate price for that service. You can then focus on providing that quality of service while spending free time on improving your skills and thus going above the clients’ expectations with the service. Last is the actual advertising of your work. Once you have the hard work and quality covered, this is fairly easy. It starts with word of mouth recommendations from clients happy with your service. On your end, photos and a website are a great start to be able to show what you’re capable of to potential clients. In addition to the website (which can be as cheap as free and as expensive as you want to make it), there are many free tools to advertise your services, such as social media (Facebook, Twitter, etc. ), review sites (Yelp, Google, etc.) and local car clubs/shows. Unfortunately, I could write a book on each of the different tools and methods for marketing, but even then I wouldn’t cover every possible or best way to advertise your services to new clients. The goal here is to start with these core values of your business and build the marketing aspect out of it, rather than spend thousands on advertisements and be overwhelmed by either too much business or almost none at all (yes one of those is a much better problem to have!). We’ll be adding some more articles regarding this topic in the near future, but this should get you started on the right path to doing good work and telling potential clients about it. If you are interested in more articles to help you run your business, check out the Running a Business section! Well put Ivan! Sadly here in New Zealand no one is really prepared to pay for that $2000 correction job & although there are a few of us here that can do them well, they pay only about $800. Based on that it is about the only reason I do this as a serious hobby as my ‘day job’ pays very well. (Serious enough that I have done Todd’s class at Esoteric.) I have plenty of ‘clients’ & pretty well much all of my work is through word of mouth. I don’t really need to advertise & my only ‘marketing’ is Facebook, business cards & stickers customers let me put on their car! And you actually mentioned “cheap” ($200) work which few, except car washes, want to do but it is also a good way to bring in work while you grow your business. I don’t think I mentioned “cheap” or “$200” work Danny. As a long time client of Ivan’s, I’d like to add a comment from the customer’s viewpoint. For most of us (customers) the cars we bring to you represent a significant investment – financially and emotionally. We need to have confidence that you know what you’re doing and that you’ll take care of our babies. Don’t try to BS us and don’t fake it if you don’t know how to answer an inquiry. Be straight with your customers, do good work at a fair price, and we’ll return to you. Service is the number one factor in any business. I heard a pretty popular detailer on his video talk about not going above and beyond for every single customer. In my opinion that’s garbage. I treat every customer and every vehicle the same. Whether you drive a Ford Focus or a high end Lambo your car is important and as a customer you are the driving force of our business. I leave a small gift and 10 business cards on the dash of every car o detail. That has brought in more business than I thought. Right around Christmas time I bought a bunch of small teddy bears and some Hot Wheels and left those as gifts. If it was a female, she got a bear and if it was a male that drove a Camaro he would get a Camaro Hot Wheel. As far as marketing goes, what has worked well for me is actually going out on my down time and walking around parking lots with business cards and 10% off coupons and talking to people about their car. I get them excited about what they drive and let them know that everyone deserves a clean car that looks great and smells fresh. When I’m talking to them sometimes other people join in. There are so many ways to get out there but this has worked for me. Happy detailing everyone and I wish you all a prosperous year. Have fun and love cars. I do most of the marketing methods you mention. Going out off your way to satisfy a customer is essential. I have provided new folks to the area with names of high quality garages which work on standard and high end vehicles. As a result these garages refer a lot of business to me. Word of mouth works best for me and I have posters and business cards in community centers. I ask permission from the customers who live there and if I’m allowed I give them a discount. I detailed 80 vehicles last year and plan to do 100 this year. I work alone and I’m retired so I work on my schedule. As a mobile car cleaning guy for 11 years now, my phone rings most of the day. People have found me via my website, and my vehicles that run around town or parked in the local grocery store parking lot. I charge what I feel is a fair price for honest work. I enjoy what I do and will continue till my body says otherwise. Thanks. Hi . my name’s Tommy . I’m 27 kinda young. IV been detailing for 12 years. I started doing my parents vehicles when I got my first car and license my ambitions exploded. I took detailing courses and realized that this is my calling. I agree that hard work and customer satisfaction is the only way to succeed. You have to be able to turn dust into gold . in detailing term’s you need to turn a oxidized panel into a reflective mirror. My company is called Pristine Clean YYZ and I’m based in TORONTO CANADA . As my passion and techniques grew I took some schooling to grow my skills. high Speed Polishing,low Speed Polishing. Paint Correction, water Sanding etc..
By impressing customers and positive feedback is then strongest way to grow your self. I realized and this is for all types of people from everywhere. If a customer pays for a service 500$ in the back of their mind they expect a 700$ finish. I tend to always try and take a STEP further. For example .. If a customer pays for a basic service . basic interior and exterior was Wax Clean. I tend to also do something EXTRA to satisfy them. I totally agree with you. You provide us such a nice stuff, which is very informative.